A few months ago on this JAPAN Style blog, I wrote about “Kobito Zukan” (The Dwarf Encyclopedia). It was originally a picture book for children. However, the dwarfs’ “kimo-kawa” (ugly but cute) appearance has attracted not only children but also adults, and a variety of “kobito” goods are now available at stores. 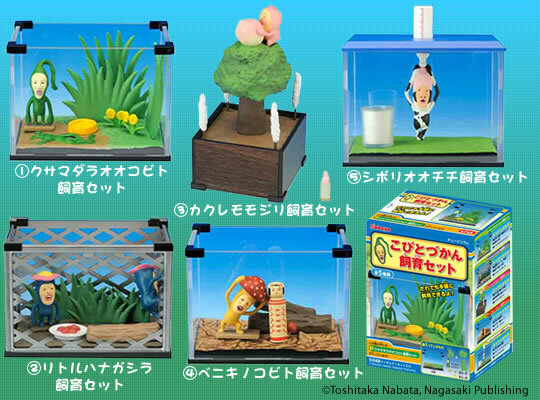 Just recently, an interesting product, the “kobito” breeding kit series was released from Kabaya. There are five different types. Each one contains materials required to breed the different kind of kobito. Of course you can’t actually breed the kobito, but you can experience the faithfully reproduced kobito world as seen in the books and DVDs! I want to get No.2 (Little Hnagashira one)!